In this video, Dr. Huntoon talks about cholesterol and what you need to understand if you have been placed on statin medications. Understanding why your body produces cholesterol and why traditional medicine is not fixing this epidemic would be prudent for anyone who cares about their family. Knowing what the effects of taking statin medication is and why you have your problem would be important. The side effects of your medication will lead to B Vitamin issues, aka Beriberi. B vitamin deficiency or beriberi of the heart starts to cause heart palpitations on exertion or excitement early in the disease. Dyspepsea (difficulty breathing or air hunger) follows as the disease progresses. The heart naturally enlarges with beriberi. Most cases of enlarged heart are diagnosed as cardiomyopathy by cardiologists, rather than their true diagnosis of a beriberi heart. As Beriberi Heart Disease progresses, characteristic changes take place in the electrocardiogram. A cardiologist would call these high P and QRS, with abnormal T waves and prolongation of the PQ interval. Heartbeats begin to become abnormal with what is called eptopic beats. The pulse rate is usually fast, but could just as easily be slow. There is often a characteristically high systolic (1st number) and low diastolic (2nd number) blood pressure - with the diastolic often below 60. This low diastolic number can become critically low in children. And it is frequently found in kids with ADD/ADHD (also B vitamin deficiency problems from the over-utilization of sugar in the diet). Beriberi produces profound negative effects on the autonomic nervous system (remember, this is the one that runs your heart). The heart can go too fast (tachycardia) or too slow (bradycardia). And beriberi also causes hyperkalemia - too much potassium - critical to the heart. It is remarkably common in heart patients. Both hypocalemia (not enough calcium) and a heart condition called long QT syndrome are caused by beriberi of the heart, even though this information is always ignored and the real diagnosis is never considered. 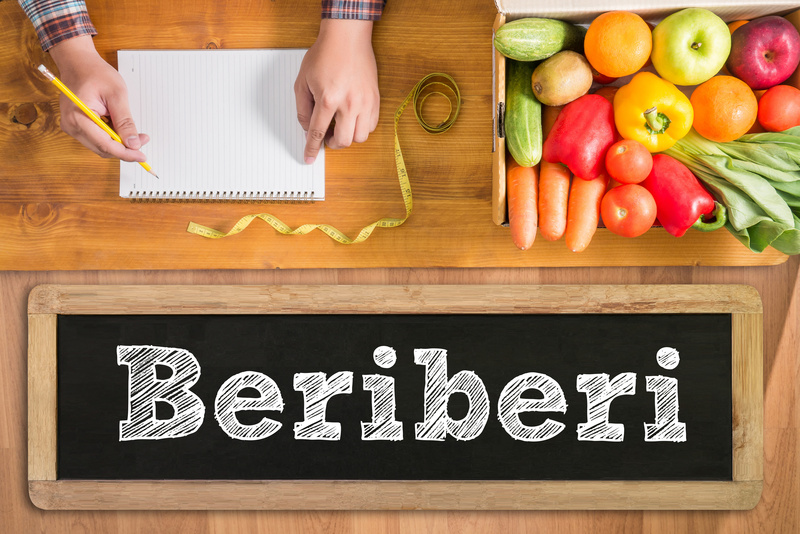 And finally, beriberi also is one of the main causes of diabetes. Diabetes complicates more than half of all cardiac cases. And both are caused or made worse by B vitamin deficiencies and beriberi of the heart - despite that fact that in diabetes, this diagnosis is also never considered. This condition is caused by the Standard American Diet, which consists of lots of refined and processed carbohydrates. Compound it with the over-utilization of antibiotics and the other Digestive System Disruptors, and you will no longer be able to absorb any B Vitamins. The result? Heart Disease! The Standard American Diet became even more prevalent as it became the gold-standard "heart-healthy diet," prescribed by most cardiologists - the low-fat diet. The fat was simply replaced with carbohydrates, making the underlying cause of heart disease worse. That is the reason why, after 30 years of cholesterol-lowering at all costs combined with the ridiculous low-fat diet, just as many people, if not more are dying from heart disease as ever! Remember, heart surgeons who have been inside the heart and coronary arteries of thousands of patients are beginning to finally admit that "we have been wrong for over 30 years!" while completely ignoring the underlying cause of heart disease. No matter how much money remains to be made from drugs and medical procedures, the cause of heart disease is still beriberi of the heart and inflammation in the linings of the blood vessels. These things are caused by nutritional deficiencies of vitamin B and phytonutrients like flavinoids brought about by the low-fat and Standard American Diet of excess refined carbohydrates. This causes type 2 diabetes-type changes of excess glucose and insulin coursing through your arteries, and the resultant inflammation to the linings of your blood vessels. These changes cause clogged arteries and plaque, all worsened by the B complex deficiency which causes beriberi syndrome - weakening and almost paralyzing the muscles and nerves of the heart. This produces the usual enlarged, weakened, water-logged heart with leaking valves and erratic beat. Most all other findings on your heart-disease report are simply cascading symptoms that follow the underlying causes that go ignored, undiagnosed, untreated, and worsened by other medical treatments of the symptoms. The following excerpt is taken from Health Alert, written and published by Dr. Bruce West. Anyone who has read Health Alert for longer than 6 months knows that I have always maintained that cholesterol is not a cause of heart disease. And for a majority of heart disease patients, beriberi (B vitamin deficiency) of the heart is the underlying cause of the disease. Few people in the world of medicine - and even fewer in the world of cardiology - have taken the time to consider, no less test, this theory. I have personally tested it and found it to be true in tens of thousands of heart patients over a period of more than 30 years. Your heart is run basically by your Autonomic Nervous System (ANS). This is the nervous system you do not have to think about, but the same one that is under assault when you eat a diet that is deficient in B vitamins and thiamine. A thiamine-deficient diet is the same diet that causes beriberi. The symptoms of a B vitamin-deficient diet are too nurmerous to mention. The combined symptoms make up the clinical picture of patients who have fallen prey to the diseases of the modern era. Not the least of these is heart disease. Still, no one has taken seriously those of us who are attempting to solve a disease (beriberi of the heart) that has been truly epidemic for centuries! Associated with this B Vitamin Deficiency is what contributes to the inability to absorb and assimilate B Vitamins in a normal healthy fashion. This is due to a very common health epidemic we have in the US and is secondary to taking antibiotics. Antibiotics, and the other 14 Digestive System Disruptors, destroy the normal healthy balance within the digestive system known as the microbiome. Once this occurs, we lack the necessary good bacteria required to help with the absorption of our food material, specifically B Vitamins. As a result, the heart does not have the necessary B Vitamins (Beriberi) needed to maintain normal heart functioning. The outcome is irregular heart beats and other heart issues. Instead of giving 5 cents worth of B Vitamins and probiotics with each meal, they would rather do the Big Ticket item of heart surgery and putting in pace-makers. Don't let this be you!! So...if you have heart disease, with or without diabetes, and with or without any of the diagnoses shown in this article, and if your disease is caused by beriberi of the heart (a very good likelihood), and you are undergoing Standard Medical Care which uniformly ignores beriberi as the potential cause of your disease, you are in trouble. That is why you will routinely hear heart patients say that they were spiraling downward under their medical care until they started our heart protocol. The reason is simple - we considered, evaluated, and treated for beriberi of the heart. This resolved the desperate cries (symptoms) coming from the patient's ANS and heart for B vitamins, beginning their cure. And remarkably, the whole B complex was necessary, as isolated thiamine or the synthetic B vitamin would routinely fail to make improvements. Given this simple treatise on a disease that was epidemic for centuries, and that is still present today as beriberi of the heart - marked by the very symptoms that it causes to the nervous system and heart of millions of Americans. And given the fact that it is universally ignored by medicine, that its symptoms are instead treated with powerful heart drugs and even surgeries, and that it remains fomenting, just below the surface in most heart patients despite any and all medical treatments, it is unnerving at best and horrific at worst. Do not fall for the contention that beriberi no longer exists. It is the main cause of most heart disease today. Some have likened it to throwing a wet blanket on a fire - like smothering the heart. Once beriberi of the heart sets in, your heart will go through such a myriad of changes and deterioration that diagnosis becomes almost impossible. If you have any kind of heart problem, or most any health problem at all, please consider and treat for beriberi of the heart. Eat a healthy Mediterranean diet. Take whole B complex cardiotonic supplements. The premier supplements that supply thiamine and all the B vitamins, including B4, are Cataplex B, Cataplex G and Cardio-Plus from Standard Process. You can take it from me, the one guy who has been saying beriberi of the heart is the real underlying cause of heart disease in this country for more than 30 years. By the way, substituting isolated and synthetic nutritional supplements and B vitamins simply will not work. In fact, it will feed the problem. Don't be penny-smart and pound-foolish! Contact your Holistic Chiropractor and begin to get and apply the understanding written about here and take control of your health and your life. Do Not wait until you have end stage disease. Dr. Huntoon has worked extensively with people who suffer with Beriberi for over 27 years. You could fly to the Northwest to see Dr. West or you can come to Dr. Huntoon in the Southeast or Northeast. Either way, get the truth about your situation and see the results for yourself.